BEIRUT — Syria welcomed Tuesday the Turkey-Russia deal declaring a demilitarized zone around Idlib province but vowed to keep up its campaign against “terrorism,” either through military action or reconciliation deals with the opposition. The Turkey-Russia deal reached a day earlier was welcomed by the Syrian opposition and rebels, saying it improved their standing after consecutive defeats elsewhere in the country to government forces following military offensives and tight sieges leading to surrender deals. "It will revive the revolutionary spirit," said Alaa Moadamani, a fighter who moved from the Damascus suburb of Daraya in 2016 and has settled in Idlib after an evacuation deal. Idlib is the last rebel-held corner of Syria, although foreign troops and local proxies remain in areas adjacent to Idlib and the country's east. The leaders of Russia and Turkey agreed Monday to establish a demilitarized zone in Syria’s Idlib region, the last major stronghold of anti-government rebels where fears had been running high of a devastating offensive by government forces. Countries around the world have welcomed the deal because it prevented a feared Syrian government military offensive against the overcrowded rebel-held enclave in northwestern Syria. But the agreement, which calls for disarming the rebels including some of the world's most radical fighters, raised concerns about how it would be implemented. Many feared that, like previous cease-fires, it may end with renewed violence. Syria's Foreign Ministry said the deal came after "intensive consultations" between Moscow and Damascus. Moscow has backed Syrian President Bashar Assad since 2015, turning the tide of the war his forces were struggling to win. Syria welcomes any initiatives that stem the bloodshed, the ministry said. "It also reaffirms that it will continue its war against terrorism until it liberates every inch of Syrian territory either through military operations or local reconciliations." Syria said the deal reached during talks in Sochi in Russia is bound by a timetable that must be respected, calling it a continuation of previous de-escalation zones. Russia, Turkey and Iran have declared four de-escalation zones around Syria since last year, all of them but Idlib ended in a military offensive and deals in which the rebels surrendered. 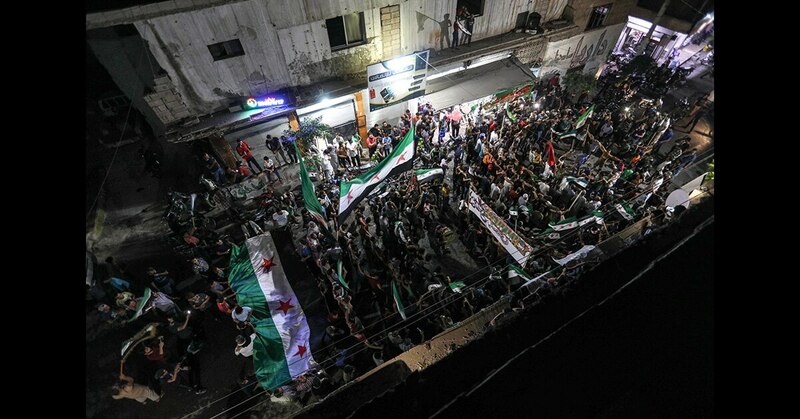 Those who refused to accept government authority were bussed to Idlib, now home to nearly 3 million people. A pro-Syrian government newspaper, Al-Watan, reported Tuesday that the agreement envisions three stages that will end with the government's authority restored in Idlib. The first phase is to establish a de-militarized zone along the front lines separating government and rebel forces by Oct. 15. Then the rebels are to hand over their heavy weapons by Nov. 10. A third stage, according to the Al-Watan, will see government institutions return to Idlib after insurgents withdraw from residential areas. In declaring the agreement Monday, the Russian and Turkish leaders only spoke of the first two phases. None mentioned the Syrian government regaining authority in Idlib. Such a proposition threatens to undermine a deal put in place in the absence of a political solution. Idlib is home to some of the government's staunchest opponents, including civilians and insurgents. On the other hand, Turkey's Foreign Minister Mevlut Cavusoglu said the deal ensures the continuity of Syria's moderate opposition. Speaking on Tuesday, he said the agreement would allow civilians and anti-government rebels, backed by Turkey, to remain in the 15-20 kilometers (9-12 miles) deep demilitarized zone and "retain light arms." Without the agreement, "there would have been no opposition left," Cavusoglu said, calling it crucial for a lasting political solution. The minister said the demilitarized zone would be cleared of "radicals" and heavy weapons, such as tanks and rocket launchers. Cavusoglu also said Turkey would need to dispatch more troops to patrol the area, along with Russia, while also retaining its 12 observation posts.